Political studies, restricted speech, and “transformation” tasks: Teachers on assignment in Xinjiang under intense control, causing depression and anxiety. 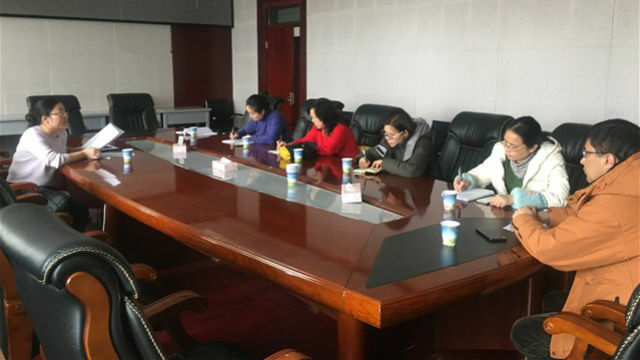 A meeting of teachers on assignment at Xinjiang Radio & Television University. Teachers from other parts of China assigned to teach in the Xinjiang Uyghur Autonomous Region are reporting oppressive politicization of their jobs, taking them away from teaching and making them into ideological agents. Zhang Li (a pseudonym), a teacher assigned to a school in Xinjiang’s Kashi prefecture, told Bitter Winter that she must inform the director of teaching about what she is planning to do for the day every morning, and she must attend a two-hour meeting every evening. The teachers also are required to study the core socialist values, the Disciplinary Regulations of the Chinese Communist Party, and so on. After each political studies class, teachers have to write an essay about their gains from the study. The school carries out patriotic education over the public address system at random times. Typical content of the lessons could include: “Xinjiang has been part of China’s territory since ancient times. Without the Communist Party, there would be no new China….” When the announcements start, even if they are in the middle of a lesson, all the teachers and students must stop their classes, listen to the report, and take notes. Afterward, the teachers must write an essay of about 500 Chinese characters on the topic. The school arranges for a specially designated person to review such essays written by ethnic Uyghur teachers to observe whether they have any reactionary thoughts. According to Ms. Zhang, the cellphones of every teacher at the school are monitored. The school inspects teachers’ phones regularly to check whether they contain any sensitive content or whether they have watched any so-called “anti-Party videos” (generally any videos that expose the dark side of society). Teachers are prohibited from viewing any videos or other materials about the Party, the school, or Chinese politics that have not been distributed by the school. At the same time, the school forces teachers to forward the Party’s political propaganda, policies, regulations, and work information to their WeChat profiles. In particular, Uyghur teachers must send several such WeChat messages every day. Ms. Zhang revealed that one of her colleagues was arrested and detained for sending some messages complaining about the government. A teacher in Kashi prefecture’s Shache county told Bitter Winter that the authorities require teachers to fulfill “Three Entries, Two Contacts, and One Friend-Making” in order “to clear students’ minds and eliminate unstable factors.” The “three entries” means that teachers need to enter the school, enter the cafeteria, and enter the dormitory. The “two contacts” refers to contacting parents and students. The “one friend-making” refers to making friends with students. Every month, each teacher must meet and take photos with the parents of 12 students. They must record the contents of their conversations and post the images in a booklet that is later submitted to the school for review. Also, during holidays, teachers are required to join the “home-stay program” – move in with Uyghur families, promote the Communist Party’s policies, and transform their thinking. In today’s China, even those who answered the high calling to educate the next generation have been co-opted into the surveillance and propaganda state.